We started last year by announcing our budget of $4,400 per month. We had received an average of $4,000 per month in 2015, but had spent $4,200 per month. We set our budget for 2016, and God gave us above and beyond! You gave an average of $5,266 each month of 2016. We spent a bit under $5,000 per month. Wow! This includes a big surprise - land! But didn't someone donate land to you? you ask. Yes. That is still there, and it remains in bureaucratic limbo. What we bought is fully ours. We are still paying off the last 25% of the cost, about $3,000. For 2017, our budget is $5,000 per month. As usual, our high expense months are when school fees are due (January, May, and August) and when we pay for our airfare. Our MKKs are advancing in school. We have fewer primary school MKKs than ever before, more in high school, and more in college or university for the full year. Jacob, Jane, John, Linnet, Agnes, Mariam, and Henry are still without sponsors. 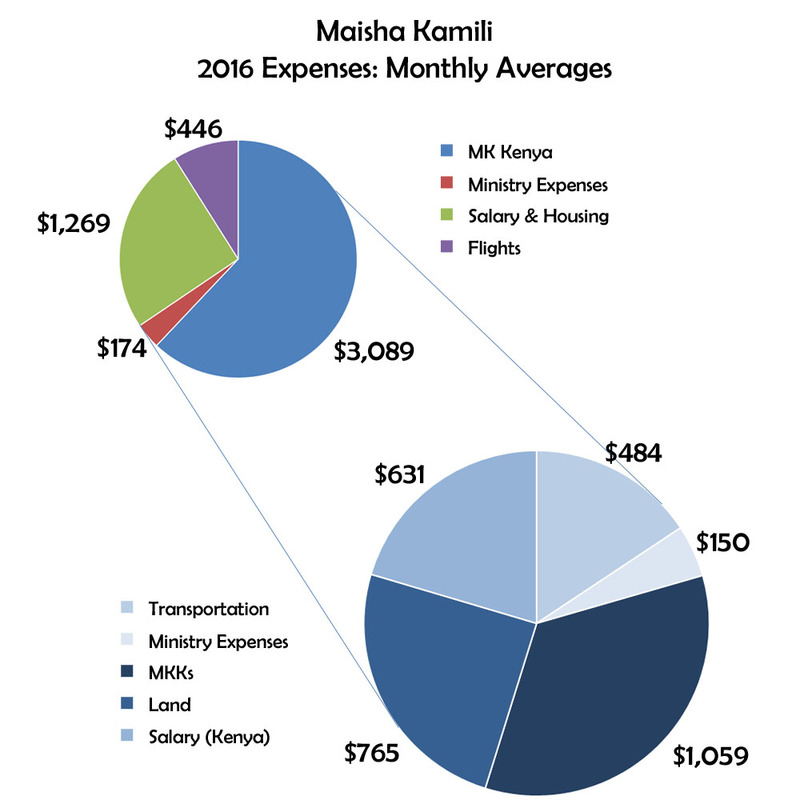 We will be spending more on MKK Camps this year. This is our chance to disciple them as a group. It is our highest priority, and we want to invest more in this. We will be taking the high school MKKs to a resort for 2 nights, where we can focus on fun and discipleship. It will cost $1,083. Rodgers has been a full-time volunteer for Maisha Kamili for 3 years. The MK Board in the US has discussed paying him in the past, but wasn't sure there was money in the budget for it. In 2016, God clearly revealed to us that the money is there, and Rodgers deserves to be paid for his work. This will begin in July. We are planning the Kahindi family's next trip to the US for November and December this year. We budget $6,000 for airfare.